Q Acoustics 7000i aims to take the style speakers crown | What Hi-Fi? Take a look at the new Q Acoustics 7000i speaker package, which is aiming to take top spot in the sub-£1000 style speaker system market. 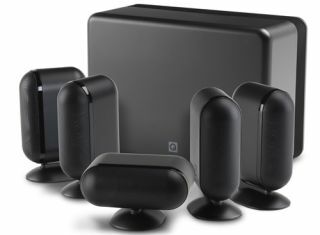 Building on the success of the Q7000 system, the new 7000i speakers promise to deliver two-channel sound as confidently as surround sound, no mean feat when it comes to compact speakers such as these. The 5.1 system comprises five full range satellite speakers, each with twin, custom-designed, 75mm ultra long throw bass/midrange drivers and 25mm 'ring radiator' tweeters. Cast in aluminium, the speakers come with an integrated stand, which can also be configured to become either a wall or ceiling bracket, and includes cable management. The Q Acoustics 7000i LR speakers come as a stereo pair, joined by the 7000 Ci centre channel. A matching floorstand is also available. There's also a new subwoofer, the 7070 Si. An 8in driver forms part of a new take on the 'infinite baffle' design, with slim grilles located on the top and both sides of the gloss finished unit. There's a 150-watt Class D amp inside, while the innovative design also allows the Q sub to be wall-mounted. The Q Acoustics 7000i series 5.1 speaker package is available in classic matt black or matt white, and is on sale for £900.